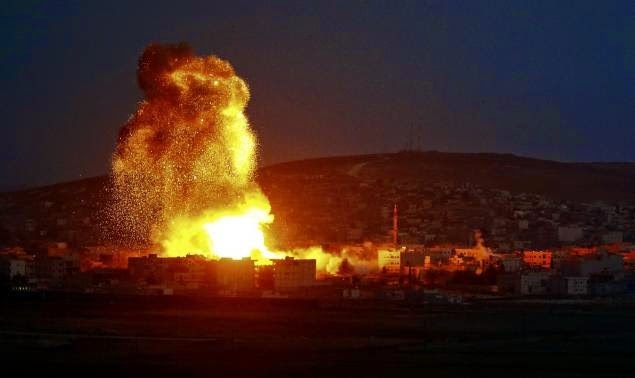 U.S.-led coalition jets pounded Islamic State targets in Kobane on Saturday. There were a total of six airstrikes against ISIL today. Earlier in the day the Islamic State shelled the city’s center and hit border areas within Turkey. YPG Kurdish fighters, with help of U.S.-led strikes, are holding out against the Islamic State for more than a month of valiant defense of their city. Kobane is already being compared to Stalingrad and that city’s heroic defense against the Nazis. ISIL’s shelling of border areas with Turkey appears to be an attempt to cut off Kobane’s last link with Turkey.